CouncilLor Ieuan Glyn Davies has been elected by Llangefni Town Council as its Town Mayor for 2018/2019. Ieuan was unanimously elected to the role follwoing the recent Annual General Meeting of Llangefni Town Council held at the Council Chamber, Shire Hall, Llangefni on the evening of Monday 14th May 2018. Councilor Davies is employed by the Welsh Social Housing provider “Grwp Cynefin”, is married to Sonja with two young children, Sam and Seb, and has lived in Llangefni al his life. As well as spending precious time with his family, Ieuan is a keen runner and member of Cybi Striders Running Club, a passionate Football supporter who closely follows the performances of Everton and the Wales national side. 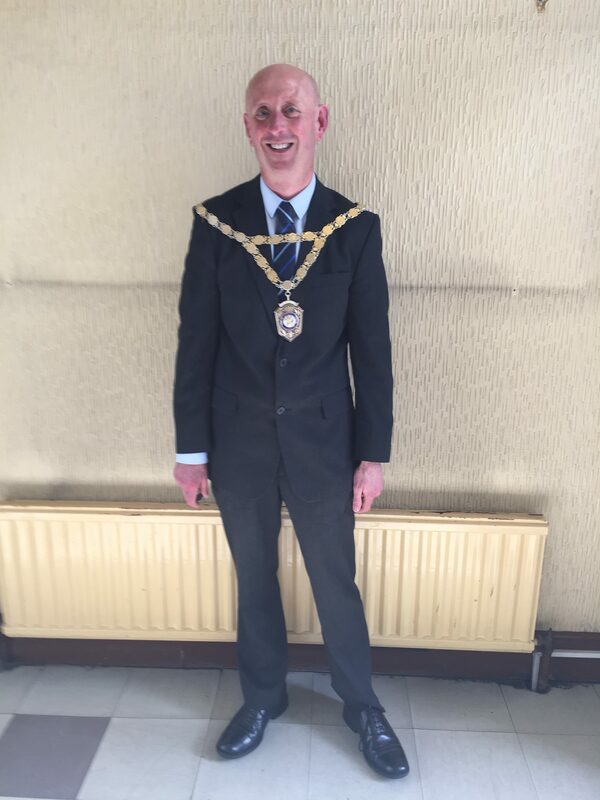 Ieuan commented, “I feel it is an honour and proud achievement to be accepted as the Mayor of Llangefni,espacially as my family ties have a long term history within the town. I will endeavour to represent and offer my commetment as best as I can for the good of the town of Llangefni. It is a daunting challenge to follow in the footsteps of the two previous Mayors but also with slight nervourness, one that I am looking forward to. These are exciting times for Llangefni and hopefully myself and the Town Council can support a vision that will enable the residents and visitors to Llangefni to gain a worthwhile experience from the town. I am confident that with vision, commitment and unity we can make a positive difference within our community”. In his farewell address as the outging Mayor, Councilor Dylan Rees thanked all the Councillors and staff for their support throughout his year in Office. He also challenged the Councillors to display the vision and commitment needed to bring about significant changes in the town. Councillor Margaret A. Thomas has been elected as Deputy Mayor for 2018-2019.